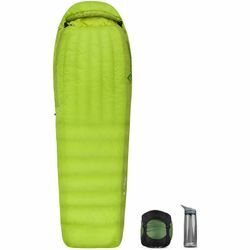 Sea to Summit Ascent AcI 25 Sleeping Bag. The Ascent™ down sleeping bag redefines what versatile means in a sleep system. Complex construction and high-quality down keep you warm when it’s cold outside, while the triple-zipper Free-Flow Zip™ system ensures you stay cool and ventilated when the weather warms. IS THIS DOWN SLEEPING BAG…? Warm enough for cold-weather use? Yes. The high-lofting down, technical hood, oversized draft tubes, and draft collar make the Ascent 25°F and 15°F true 2.5 – 3 season bags. For colder weather, you might choose the Ascent 0°F model and pair it with a high R-Value sleeping mat like the Comfort Light Insulated.